I embraced exfoliating at a young age as my skin was just so damn dry and it really helps it sort itself out and take in treatments and masks better. Like most people, I use manual facial scrubs but I've also been embracing acid based toners for a while now and they've made a huge difference to my spot laden skin. They might sound a little scary, but they are really gently on the skin and effective. 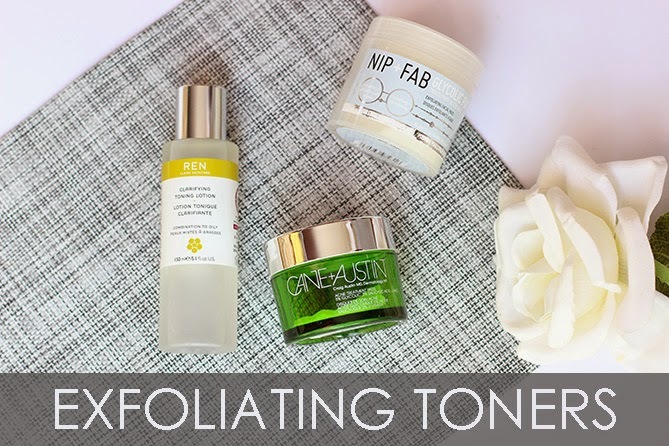 So today I thought I'd talk you through some of my favourite exfoliating toners. These pads totally converted me to acid exfoliants. I starting using these a while ago now and am on my second tub. Each tub contains 60 pads and the directions state to use them twice a day, but I think that's a bit much and started using them just in the evening. I did find that these tingled a bit for the first few times that I used them, but this does go away and isn't anything to be concerned about. The pads contain both glycolic acid (5%) and salicylic acid (2%) and my skin loves this combination. Glycolic acid is an Alpha Hydroxy Acid (AHA) which exfoliates the dead skin off the surface of your skin, making way for lovely new skin. It also helps reduce discolouration, and in my case, blemish scarring. The only thing to be mindful of when using AHA's is that they increase photosensitivity, so always use a sunscreen. The second active ingredient is salicylic acid which is a Beta Hydroxy Acid (BHA). This is a bit more complex as it penetrates deep into pores to clear them out (nice), and in doing so helps reduce breakouts. It also has anti-inflammatory properties which again is a bonus for clearing up blemishes. After two weeks of using these pads I saw a massive improvement in my skin and they are a staple for me now. As much as I love the C+A pads, they are pricey and I've been on the hunt to find something a bit more purse friendly to maintain my skin. These are much better priced and also with 60 to a tub these are a nice alternative. They contain 2.8% glycolic acid to exfoliate the skin, as well as hyaluronic acid to give you a moisture boost and blue daisy to soothe and calm the skin. I don't find these as effective as the Cane & Austin pads, but they are really nice none the less and have helped my skin through its recent tantrum. I think they are perfect for anyone just venturing into acid exfoliants and wanting something effective, yet gentle. The pads are part of the Glycolic Fix range which also includes a face scrub, serum and body scrub. Once I run out of face scrub I will be giving this one a go! I bought this bottle ages ago but it got a bit lost in my stash so I've only recently started using it. REN have since renamed this range to the Clarimatte range (why? ), but have not changed any of the formulations to my knowledge. This contains a whole host of AHA's including glycolic acid, citric acid, lactic acid and tartaric acid, along with salicilin (willow bark extract that can be made into salicylic acid). It also contains Flavonoids from Mayblossom extract which is anti-bacterial and tones the skin while also reducing sebum production and pores. I find it feels quite refreshing on my skin and I'm really enjoying using it. Have you tried any of these exfoliating products and if so what did you think? I really want to try the REN Clarifying Toning Lotion after reading this post! What is bad is I am meant to be on a spending ban LOL. I need to go to beauty rehab!